We have a coffee culture borrowed from the Italian communities. New Zealanders are used to long blacks and flat whites; espresso-based coffee with a lot of perceived acidic and bitter flavours. Dark coffee, drunk hot. But coffee doesn’t have to be hard and fast. Our Consumer staffer trialled several soft brew methods, assessing how easy the different processes were to use and, just as importantly, clean up afterwards. 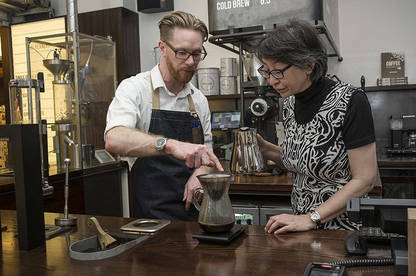 New Zealanders have grown averse to filter (soft brew) coffee. But as coffee specialist John Cole, from Mojo Coffee, points out, “there’s nothing wrong with filter”. While espresso is a “wake-you-up” coffee with intense flavours, soft brew is subtle and allows different flavours to come to the fore. While there is a fine line between good and bad espresso, soft brews offer more leeway. For our trial of soft brew methods, we went to The Beanery in central Wellington. The Beanery is a Mojo Coffee café that roasts its own beans and specialises in soft-brewing methods. We enlisted the help of John and Consumer adviser Maggie Edwards, a coffee novice with little experience in making soft brews. John showed us how to do the brews, then Maggie tried her hand at making them. She gave us her opinion on how easy the different processes were to use and, just as importantly, clean up afterwards. To keep the base flavour constant, so differences would be from the brewing method, we used the same coffee for each brew type. Toarco Jaya is a single origin bean from Sulawesi, Indonesia. It has notes of toffee apple and honey. There are some rules you should follow to make a damn fine cup of coffee. Soft brews are lighter in colour than espresso. They also tend to be fruitier, which means they often taste better without sugar or milk. Single origin beans (beans sourced from the same area) work nicely with soft brews because the process allows their unique flavours to stand out. John says to remember coffee is an agricultural product, so it does go stale. 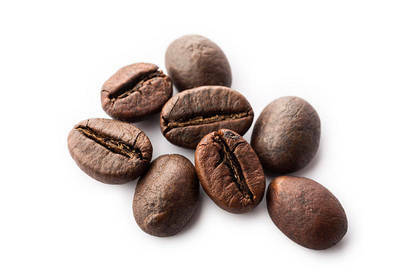 Buy small amounts of freshly roasted beans, no more than a week’s supply, and keep them in an airtight container somewhere cool, but not too cold. Grind just before you make the coffee and only grind as much as you need. We recommend a burr grinder, instead of blades, as this gives you greater control over the grind size. Even basic hand burr grinders are good for this. Check out the results of our grinders test. For grind size it’s all about surface area. The finer the grind the more surface area and the more surface area the more flavour is transferred into the brew. So soft brew coffee is ground coarser than espresso because it’s in contact with the water for longer. The amount of coffee is crucial. John recommends a 1:16 ratio of ground coffee to water. So roughly 15g (three teaspoons) of coffee for a 250ml cup. If you like your coffee stronger or weaker just alter the ratio. A digital kitchen scale is useful for this part. With soft brew pour-over methods, including plunger and V60, once the coffee is sitting in the filter add a small amount of hot water, just enough to wet it. Do this a minute or so before adding the rest of the water. This is called “blooming”, which releases trapped CO² gas in the coffee. Doing this makes your coffee taste better. After the brew it’s best to leave the coffee in your cup for a while to cool. This exposes more of the flavours from the coffee. As John says there are no shortcuts in soft-brewed coffee. 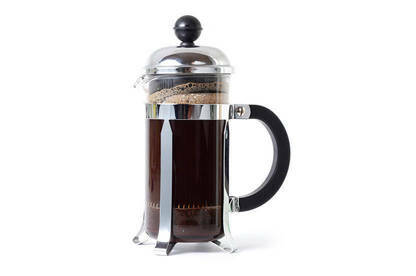 Plunger (also known as “French press”) is the most common way of making non-instant coffee in New Zealand. But far too often they’re made poorly, leaving a bitter taste. Firstly, you want to use coarser-ground “plunger grind” coffee. Bloom the coffee, then add the rest of the water. Stir and then leave to brew for three-and-a-half to four minutes. Place the lid on but do not push the plunger down until the coffee has fully brewed. After brewing, decant the coffee out into cups or a separate jug as soon as possible, as it becomes more astringent the longer it’s in contact with the grinds. When pouring, don’t tip the plunger past horizontal as this allows more of the coffee grinds to escape into your cup. Due to the fixed metal filter and all the grinds that are left inside, plungers can be fiddly to clean. We recommend buying a model where the metal filter can be removed and cleaned separately. 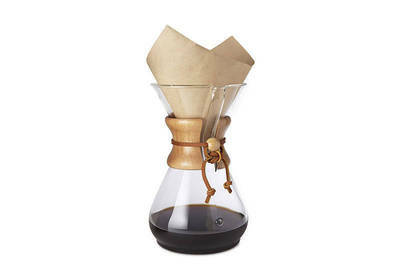 Pour-over coffee methods use paper filters either over a cup or in the top of an hourglass-shaped jug. 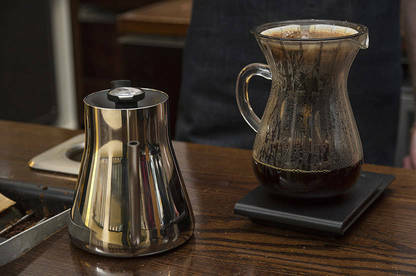 We used the Kinto Carafe for the jug-style and the Saint Anthony Industries Phoenix 70 for the cup-style. All soft-brew methods require a coarse grind, but methods that use a filter should be a little finer than plunger grind, because the water passes through the coffee. This may mean adjusting your grinder until you get the right setting. After rinsing the filter, bloom the coffee, then add the rest of the water in steady, slow circles. Don’t let the water get too close to the top of the filter. If it does, just wait for the coffee to filter through then start pouring again. Once you’ve finished pouring, wait for it to filter through. Once the dripping has stopped, remove the filter by lifting it out and dropping it into the bin. The Kinto Carafe we used for the trial has a built-in cradle the filter sits in, which makes disposal easy. The difference between a V60 and the Phoenix 70, which we used in this trial, is the angle of the cone made by the filter. V60s sit at 60° and the Phoenix 70 at 70°. The increased angle means the water has to travel through more coffee before it gets into your cup. The 70 also has open sides allowing for more even heat dispersal and easier cleaning. 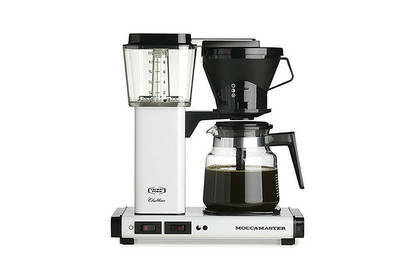 However, the Phoenix 70 is much more expensive, so what device you get could depend on how serious you are about coffee. Filter machines have a bad rap. Most people associate them with awful coffee shops where a pot sits on the warming plate all day. But there’s nothing better for getting a nice jug of filter coffee without working too hard. As before, rinse the filter. Then add the coffee, set and forget. This is the most common type of coffee found in casual dining restaurants that don’t want to muck around with a fully plumbed espresso machine. It’s simple, fast and can make lots of coffee with minimal effort. Compared to a home espresso machine it’s much cheaper and, importantly, simpler. Especially cleaning as no coffee goes into the machinery: the grinds stay in the filter and the liquid sits in the jug. 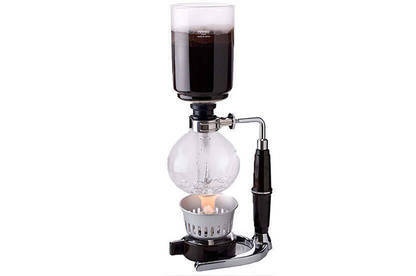 Siphon/vacuum systems use air pressure and heat to create a visually interesting coffee-brewing method. Ground coffee is placed into the top chamber. This chamber is connected by a tube with a filter to an airtight sealed vessel below, filled with water. As the water in the vessel heats up, air pressure forces it up into the top chamber where it mixes with the coffee. After stirring for a short time, the heat is removed and the bottom chamber cooled with a damp cloth. This causes the air pressure to drop and coffee slowly pours back down into the vessel through the filter. It’s an interesting way of making coffee by using physics. And it looks like a science experiment. Video by Buddy Brew Coffee. After trialling all the methods, Maggie decided the pour-over carafe was her favourite. It was simple to use and cleaning was easy compared with the other methods. Maggie noticed the difference wetting the filter made, as well as blooming the coffee. The Kinto Carafe we used for the trial has a built-in cradle the filter sits in, which makes disposal easy. A timer for the brew and the hot water jug with the spout at the bottom aren’t necessary but Maggie enjoyed using them. She also liked using the scales to measure the coffee, with all these elements combining to create an enjoyable ritual. She liked the filter machine but “wouldn’t use it”, because it wasn’t as portable. Maggie was familiar with the plunger, and said taking time to make a proper brew made it the best plunger coffee she had tried. Though cleaning up after the plunger was a big downside. There were only subtle differences in the coffee between all of the brew types. There were differences in body and mouthfeel, which mainly had to do with the amount of time the coffee spent in contact with the water. Maggie noted trying these coffees made her realise how bitter and “terrible” the espresso was when she was in Italy. Boiling the jug for a cuppa is normal but what’s the best water temperature for making coffee? Coffee experts recommend a temperature of 93°C. So boil the jug then let it sit until the bubbling stops. Some new kettles have presets for getting water to an exact temperature (see our jugs and kettles test for more information). Many brewing methods require filters. These can be bought from coffee shops and some supermarkets. Before putting the coffee into the filter, rinse it with water then tip the water out. This removes any particulates and chemicals that come with paper manufacture. Think of it like washing an apple before you eat it. So you appreciate good coffee but don’t have the budget for an expensive espresso machine, what can you do? 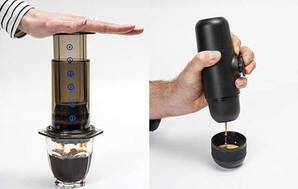 We’ve taken a look at two upstart devices: the Aeropress and the Minipresso.